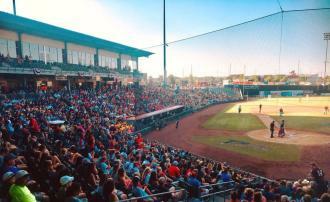 T-Bones Stadium is home to the Kansas City T-Bones minor league professional baseball team. There's no bad seat at T-Bones Stadium with 6,500+ seats. The furthest seat is only 50' from the field of play. Fans don't miss a thing, from the crack of the bat to the hum of a fastball. There's also a center field party area; party decks, and a kid’s play area with a concession stand just for kids. Fans can watch the game from any concession line on the spacious concourse or walk all the way around the concourse and not miss a beat!